What is heartbreak? 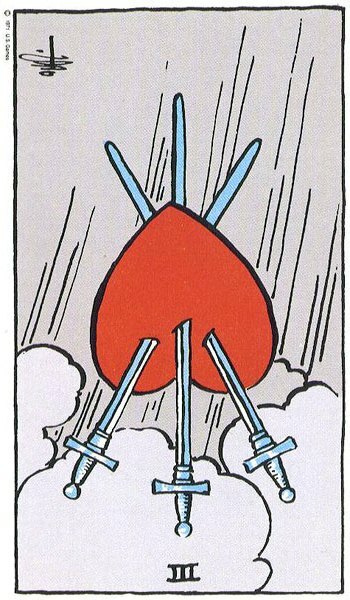 The Three of Swords card suggests that heartbreak occurs when certain thoughts or ideas (swords) pierce your sense of security in families/relationships (root chakra red). We can live with this heartbreak, or put it behind us (reversing its effects to some degree, though it may not ever be gone). Once we are at a place when we can put heartbreak behind us, or at least in the backs of our minds, we can find some peace of mind by turning to the material world and the mundane everyday things that we have to juggle (Two of Pentacles). At times when a stormy sea of emotion is tossing us around, we can take up an activity that requires intense focus (like juggling), as a way to turn our minds away from the thoughts that pierce and cut our hearts. 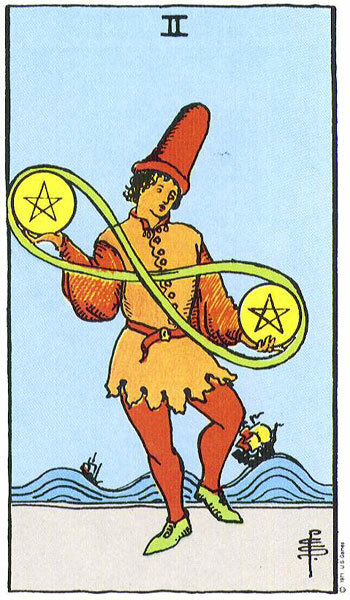 Note the green infinity symbol on the Two of Pentacles. Green, a symbol of healing, shows us that time (an infinite amount of it) and perspective can have a healing effect — and by perspective, I mean taking the long view, perhaps by turning to a spiritual practice or religious faith. Throw yourself into everyday life, staying busy with mundane activities. Find an activity that requires intense focus and concentration. Find an activity in which you matter — in which, if you drop the ball, it’s a big deal. Take a longer view, or a more spiritual perspective, on the matter. Let emotions rise and fall like stormy ocean waves while you focus on keeping all your balls in the air. At such a time, weigh choices carefully. Stay calm and find a way to have fun with the situation — find contentment and satisfaction in the middle of everyday work. Above all, stay in motion (see how the Two of Pentacles person is moving his or her feet constantly?). Physical motion: exercise helps with healing emotional pain. Note that it is the Three of Swords, not of Cups, that represents heartbreak in the tarot. Why is that? Swords are thoughts and ideas. Cups are feelings and intuitions. But the Three of Cups is a much happier looking card. There is a clue here. Our thoughts about a situation can make it hurt so much more. Thoughts add cutting power. And if negative thoughts can cut, then affirmations can heal. If we can find a way to replace negative thoughts with more positive ones, this can be a route to being able to get off the couch, at least. The Three of Swords also offers us two options for clearing our aura of negative emotions. Now I may be losing those of you who think this post is getting a little too “woo woo.” But hear me out. Rain, or falling water of any kind, can be very helpful in clearing negativity or at least taking the edge off negative feelings. A walk in the rain, or even a shower, can help immensely. Another option that you can try every day, all day, even at work, is to carry around a tiny spray bottle filled with water and your favorite essential oil (white angelica is especially good for this purpose). Spritz the negativity — or again, maybe just the worst of it — right out of your aura. The second option offered by the Three of Swords is smudging (see the clouds?). We can burn incense, or candles, or even a cigarette, as a way to clear negativity out of a personal environment. Think about how good the energy feels inside a church where incense and candles are burned all the time. We can use this same technique at home. You can also use this technique outside, somewhat unobtrusively, by burning a cigarette and wafting the smoke around. For us nonsmokers, this feels very uncomfortable (you feel like saying to people, “um, just so you know, this isn’t what it looks like!”). But it can work. Every person has to find his or her own bridge between these two cards. But it can help if you think in terms of strategies and tools, rather than saying to yourself, I’ll feel better when I feel better. Find ways to clear some of the hurting energy from your system. A final option that I don’t see in these cards, but that I will mention, is to use crystals to pull some of the pain out of your heart. Rose quartz is wonderful for this — if you hold it against your heart, or clutch it in your palm against the end of your heart meridian, it can literally pull emotional pain out. But other good crystals to consider for this purpose are hematite, black tourmaline, and labradorite — darker crystals that excel at absorbing negative energy. Clear these crystals after using them in this way, by spritzing with water and placing them in a sunny window to recharge. A final consideration: there is no right or wrong way to heal. For each person, the process is a back and forth of trial and error. Apply patience.